Located in the residential area of Rosemont in Blairgowrie, Perthshire, Heathpark House is a Victorian villa built around 1837. The house itself has bay windows, an irregular roofline and a mix of window styles which all add charm, and the accommodation is spacious. Upgraded to a high standard by the current owners, there are original working shutters, stained glass doors and windows, a large cupola, open fires and splendid high ceilings which all contribute to the period charm. The principal reception rooms are perfect for entertaining while the sitting room is a more family-oriented space; a self-contained one-bedroom flat has independent access. Upstairs the first floor is reached by means of an impressive Colorado pine staircase which leads to a wonderful drawing room from the landing, and six bedrooms, three of which are en-suite. The gardens, which come to nearly two acres, are very pretty and feature a large lawn flanked by rhododendrons, and two arches leading to a sheltered patio. The front of the house has climbing roses and clematis, while a greenhouse lies to the rear. 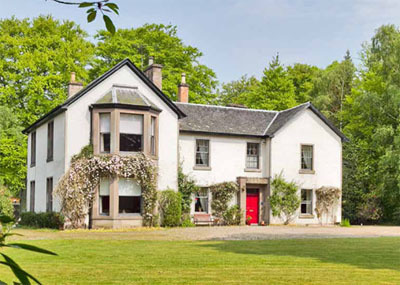 Heathpark House lies in a quiet street in Rosemount on the outskirts of Blairgowrie in Perthshire which is a vibrant market town with a very good range of shops and services. Perth is 17 miles. The guide price is £599,000. For further information please contact Strutt & Parker on 0131 226 2500 or visit www.struttandaparker.com.